Five Days/Five Greek Photos Day 1: Oh the Veg! We spent a very fast month at home in Greece. When we arrived it seemed far longer than just a year since we were last there. The events during our last three months in Nepal left us desperate for some peace, quiet and calm, which Spetses has in abundance and we desperately sucked in. Unusually this year, I never went out to hike and explore, which is one of my favourite things to do. It wasn’t an effect of the earthquake but a small, persistent injury that kept me from the hiking trails. So this year, I just focused on the simple pleasures of the low-hanging fruit – both literally and figuratively. Oh the Greek fruit and vegetables! How I love thee! 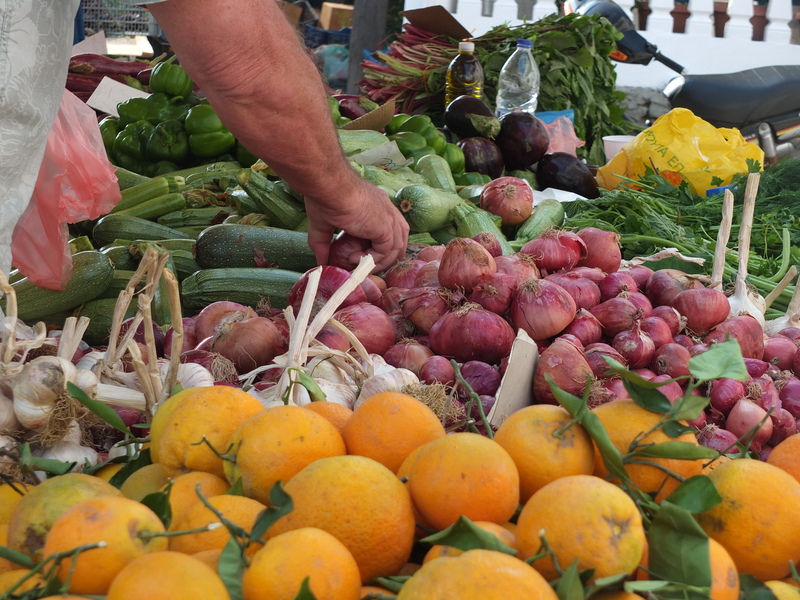 And how I loved shopping in the local twice weekly market, seeing fresh, abundant produce piled high on the tables. They glistened in the early morning sun and screamed “buy me”… even calling out suggestions for dishes I could make. That’s how good they are! Sounds completely delicious and completely rejuvenating and completely just what you needed. It looks and sounds deliciously wonderful. One day we will get to Greece! One day one day . . . . . . .
You’ve got to love local fresh veg anywhere! You do wright good blogs, Caroline. I have just been Googling Spetses and it looks wonderful. Buying vegetables in Nepal is risky because of such little control over farmers using dangerous sprays. Thanks. We were always really frustrated when we tried to cook Nepali potatoes. They took about 45 minutes to be almost cooked. It took about an hour to make french fries and they never got crispy! Between the sanitization needed and the chemical issues, we really missed the quality and variety of Greek veg. Portugual must be similar to Greece? I’m guessing that it is, Caroline. I’ve never been to Greece but from the pictures it does look very similar. We do have lots of good vegetables here. We have had issues here with the red potatoes and they don’t make good chips (french fries). They won’t go crispy and take forever. But we have no problems with the white potatoes and the supermarkets even sell potatoes for making chips. Interesting how being forced to change habits leads to new discoveries!